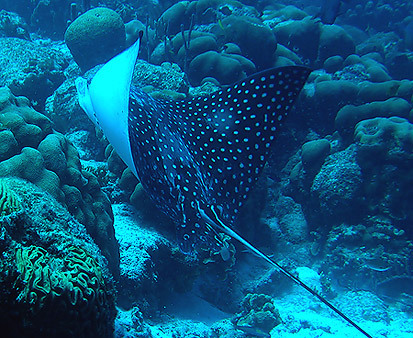 Spotted eagle rays, Aetobatus narinari (Euphrasen, 1790), aka white-spotted eagle ray, bonnetray, and maylan, grow to at least 3.5 m disc width and 9 m total length and have a recorded maximum weight of 230 kg. 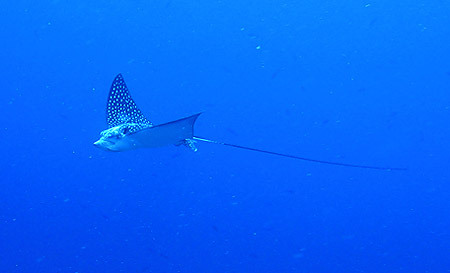 Current research on this species may reveal that what is being called the white-spotted eagle ray may in fact be several species. 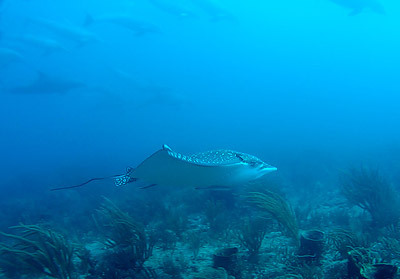 The spotted eagle ray has a long snout, flat and rounded like a duck’s bill, a thick head, and a pectoral disc with sharply curved, angular corners, and no caudal fin; jaws usually with single row of flat, chevron-shaped teeth. Each tooth is a crescent-shaped plate joined into a band. They usually have numerous white spots on black or bluish disc; with white below. 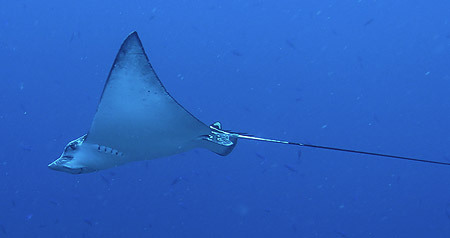 Long whip-like tail, with a long spine near the base, behind small dorsal fin. 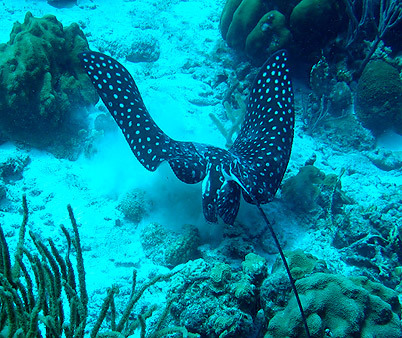 Spotted eagle rays are commonly found in shallow inshore waters such as bays and coral reefs but may cross oceanic basins. They sometimes enters estuaries. They swim close to the surface, occasionally leaping out of the water, or close to the bottom. They frequently form large schools during the non-breeding season. 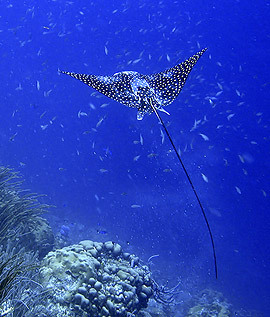 The spotted eagle ray is distributed worldwide in tropical, coastal waters. In Australia it is recorded from Shark Bay, Western Australia to Sydney, New South Wales. Depth range 0-80 m, subtropical; 40°N-34°S. Western Atlantic: North Carolina (summer) and Florida, USA and Bermuda to southern Brazil. Throughout Gulf of Mexico and Caribbean, including Antilles. Eastern Atlantic: Mauritania to Angola. Indo-West Pacific: Red Sea and South Africa to Hawaii, north to Japan, south to Australia. Eastern Pacific: Gulf of California to Puerto Pizarro, Peru and the Galápagos Islands. 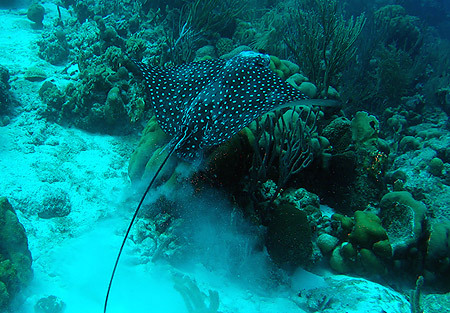 Spotted eagle rays feed mainly on bivalves but also eats shrimps, crabs, octopus and worms, whelks, and small fishes. Exhibits ovoviparity (aplacental viviparity), with embryos feeding initially on yolk, then receiving additional nourishment from the mother by indirect absorption of uterine fluid enriched with mucus, fat or protein through specialized structures. Bears up to 4 young. Width at birth 17-35 cm. According to Uchida et al. (1990) “the male chases the female in mid water, then nibbles on her dorsal surface. The female stops swimming to begin copulation. The male bites the female on a pectoral fin and bends one clasper forward, then attempts an abdomen to abdomen copulation with either clasper, usually mid-water.” Copulation lasted for 20 seconds to 1 minute. Tail spines are poisonous. A very widely distributed, relatively prolific, schooling species. This ray is taken as bycatch in much of its range in tropical and warm temperate seas. No data available on population trends.